You’ll eventually get faster and be able to run longer just by logging regular runs, but if you want to focus on increasing running speed and distance, specific techniques can help you along the way. When working on speed and distance, listen to your body’s signals. Running beyond your capability could be dangerous. Although adding miles will help you develop endurance, scaling back mileage goals occasionally can help you focus on speed rather than distance, according to ACE Fitness. You can add longer runs each week to work on distance goals, but plan recovery weeks with shorter runs so that you can concentrate on improving speed. You’ll have time and energy for speedier runs. Trimming runs by a few miles should be sufficient to help develop speed bursts while maintaining progression on longer runs. Allocate time each week to focus directly on better speed. For interval training, after a warm-up jog of 10 minutes, run at a fast pace for two to five minutes and follow it with an equal recovery period at a slow or moderate pace. Repeat the cycle four to six times to develop speed, ACE Fitness advises. Tabata training involves 20 seconds of high-intensity running followed by 10 seconds of recovery. Repeat this pattern seven or eight times. For hill training, run as hard as you can up the hill and then jog back down. Repeat this pattern several times. 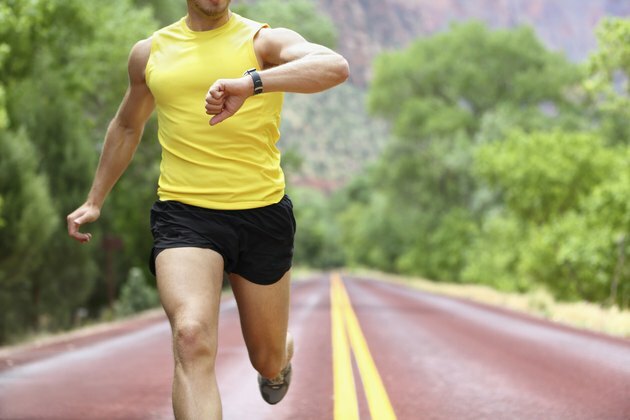 When adding distance, slow down your running rate. For example, if you typically run an 8-minute mile -- a pace of approximately 7.5 miles per hour -- you might slow down to a 9-minute-per-mile pace as you increase mileage. Over time, you can work to bring speed back up once your endurance improves. Maintain a turnover rate that ensures 85 to 90 strides per leg each minute to avoid tiring the body, Chi Running recommends. The more time your feet spend on the ground, the more weight your body must support. This can exhaust you more quickly, reducing overall mileage. When you’re working to increase speed and distance, listen to your body’s cues so that you don’t get hurt. Walk or stop if necessary, and stay hydrated by drinking 8 ounces of water every 20 minutes, according to Fit Sugar. Consume 30 to 60 grams of carbs every 60 minutes to keep your body fueled. For longer runs, stay motivated by listening to new music, tracking your heart rate on a personal monitor or running with friends. ACE Fitness: How Can I Increase My Running Speed for a Half-Marathon?